"They are saving these cats' lives." 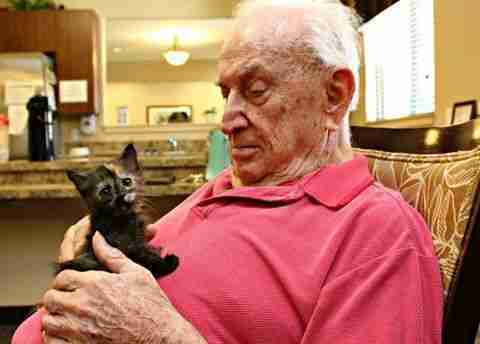 About a month ago, residents of an assisted living center in Arizona welcomed a couple of new arrivals. But unlike the seniors who call Catalina Springs Memory Care home, the new residents were taking their first uncertain steps in life. 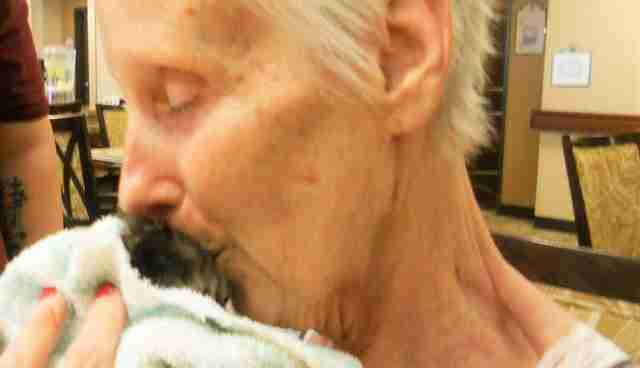 These orphaned kittens, just a couple of weeks old, desperately needed a hand. It soon became obvious that this was the perfect match. "These are people who are home. They are not working. And sometimes, they are lonely," Rebecca Hamilton, health services director at Catalina Springs, tells The Dodo. "They have love to give; they are very open to receiving love." Hamilton came up with the idea of partnering with the Pima Animal Care Center (PACC) after seeing so many pleas for help caring for kittens on Facebook. As a pilot project, the shelter sent a couple of kittens, just 2 weeks old, to Catalina Springs. The kittens had just barely opened their eyes when they found themselves in the best hands. "They are saving these cats' lives," Hamilton says. "They have a job to do that is important and are watching them grow." Indeed, the kittens are already strong enough to scamper around the center on their own. When they're not in someone's arms, or being chased down hallways, the kittens live in a large crate, donated by a staffer at the facility. At 6 weeks old, the kittens will soon be leaving the center. Once they reach 2 pounds - they've already doubled their weight - and they've been neutered, the kittens will be eligible for adoption. "So the pilot comes to a natural conclusion with adoption and then we are ready for more kittens," Hamilton notes. 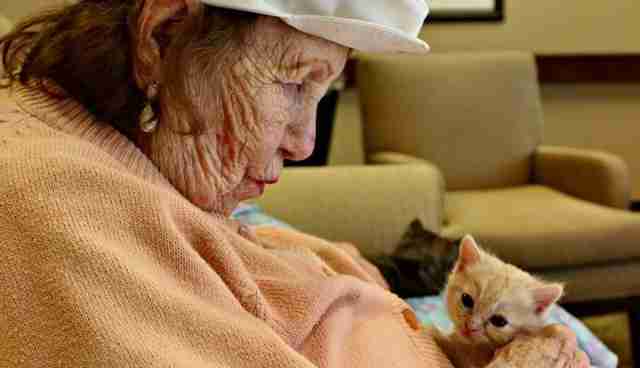 But, thanks to the program's success, Hamilton expects many more kittens will cross the threshold at Catalina Springs - and maybe even inspire more retirement homes to establish similar programs. "We have gotten a lot of interest from this," Hamilton says. "So many people say, 'Why didn't we think of this? This is really a perfect match.'" "That is clearly my hope," she adds. 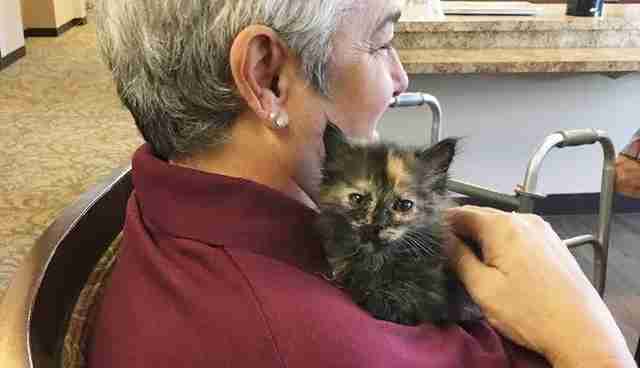 "When kitten season starts up in full force, I hope rescue groups will reach out and form partnerships with memory care units and group homes and that a lot more lives can be saved. 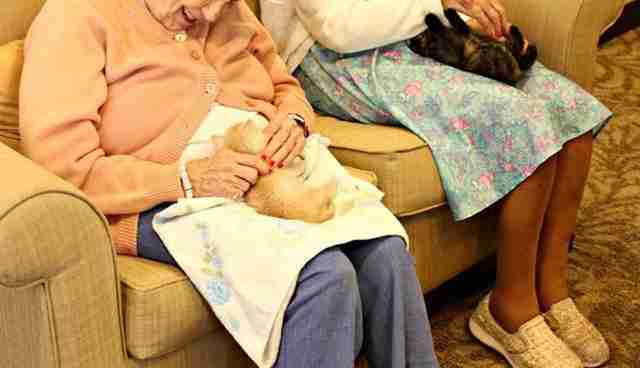 And a lot more joy can be brought to the lives of seniors."